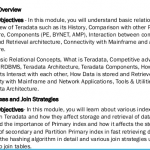 BigClasses is offering Teradata online training for working professionals and fresher. 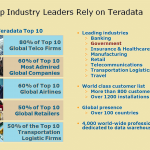 Teradata is an ETL tool constructed to deliver diverse queries, high performance, and sophisticated workload management. Our Teradata training will make you realize the actual flavor of using Teradata at your business. Teradata has some unique features for which it became very popular and standard technology. Teradata can reduce your effort and time by delivering your answer fast and giving you the flexibility to meet the analytical needs. It will help you by managing your production environment. You can achieve the optimal compression without any DBA effort. 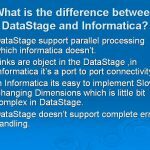 The Teradata database routinely matches a wide range of compression mechanisms to the data features and dynamically adjusts as the data changes over time through new loads. Our Teradata online training will tell you how to do all these things to achieve high performance. Teradata reduces the complexity and cost of ETL (Extract-Transform-Load) and maintains the high-quality performance.